Today we were set for a full day of sightseeing starting at 8am. 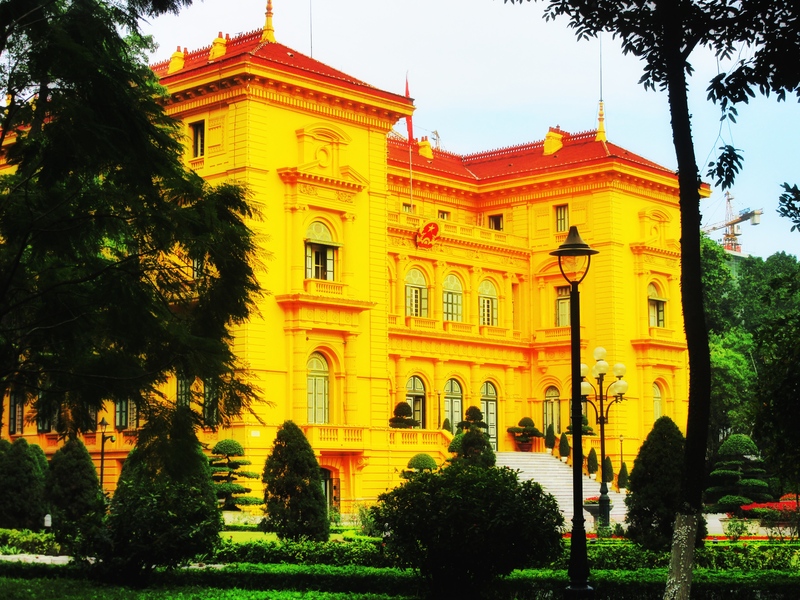 We made our way on foot towards the Ho Chi Minh Complex, which houses the Mausoleum and the presidential house. 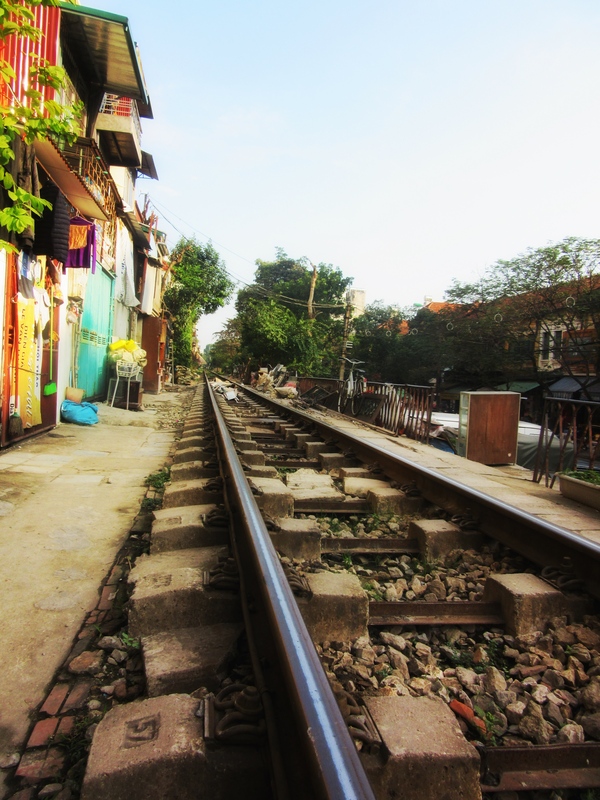 We seemed to be walking along a railway line! 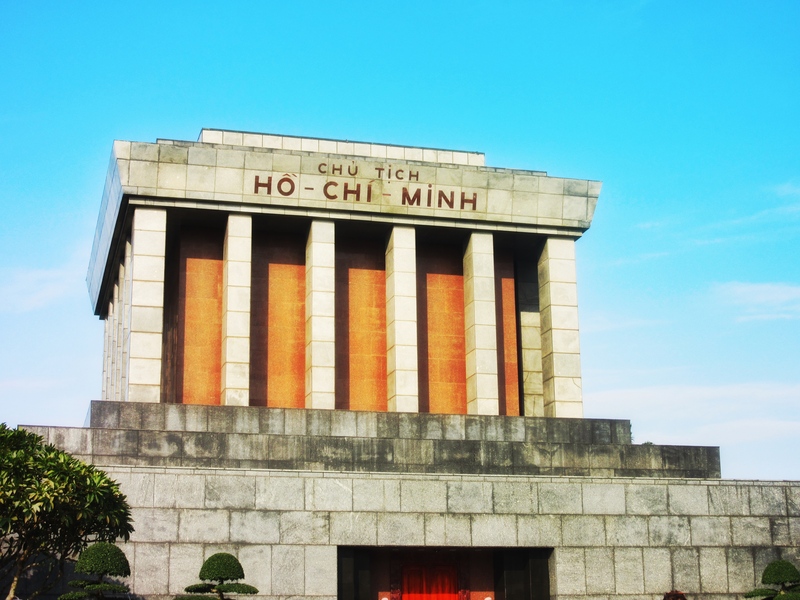 The Mausoleum is home to the preserved body of the Ho Chi Minh, despite his wishes for a simple cremation. The mausoleum is closed on a Monday, so we didn’t get to go in, but apparently both local people and tourists queue for hours to get a glimpse of his mummified body. Across the way is Ho Chi Minh’s house, which is described as a simple place as he had no desire for elaborate things. Below is a picture of the Presendital Palace which is much grander! A one pillar pagoda stands around the corner. 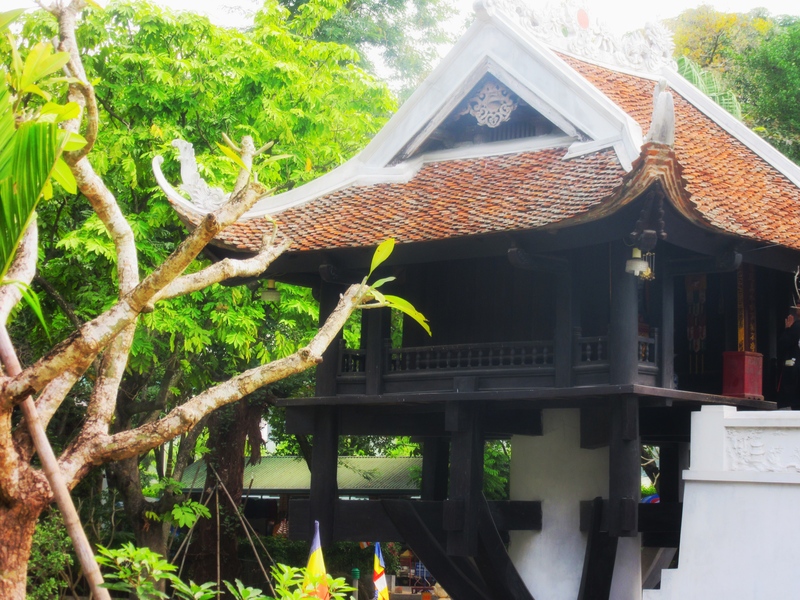 Originally built in 1049, in the shape of a lotus flower to symbolise purity, it was destroyed by the French before they left Vietnam in 1954, but has now been rebuilt to its former glory. Our next stop was the Temple of Literature, Vietnam’s first University, which was founded in 1070. It was a very peaceful place and is dedicated to Confucius. The final exams for students of the University were sat before the King and later on, those who had passed had there names inscribed on stone plaques like the one below. We continued on from there to visit Hao Lo Prison, which was referred to as ‘Hanoi Hilton’ during the Vietnam War by American Solders. The prison was built by the French in 1896 during their rule and used to house criminal and political prisoners. The prison had a number of escapes over the years, with many escaping via the sewer system. During the Vietnam war it was home to captured American solders, most of whom were shot down. There is much propaganda throughout the prison about how well these American Solders were looked after before they were handed back to America, however this is a very biased view and I’m not sure the American soldiers would agree. 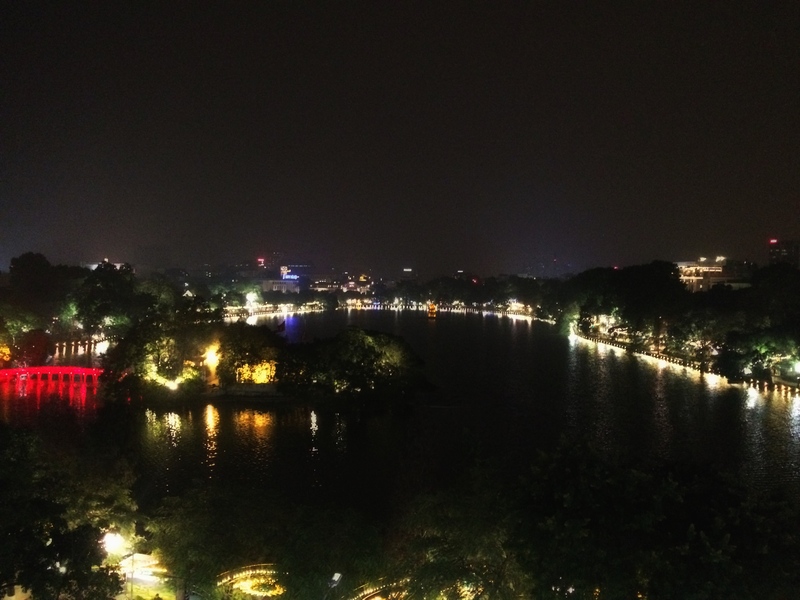 After the prison, we made our way to Hoan Kiem lake, visited Ngoc Son Temple, which is a pretty tree lined temple on the lake. We walked along the busy streets, did a bit of browsing in the shops and maybe a few purchases and then made our way to lunch, where we had some nice views of the lake. Once we’d had lunch I returned to the hotel as I was completely knackered, my feet were killing me and chilled out for a bit. Dinner time soon came round, and me and the couple I caught the flight with had arranged to go for a nice meal in a restaurant over looking the lake. We had originally booked a table outside, but it was quite windy and chilly so we headed inside instead, but not before taking in the lovely views first. The food was amazing, and for once it all came at the same time, something that had not really happened in any restaurant we’d been too so far on this trip, with everyone taking bets as to who would be last to eat! I had pork belly Spring rolls to start, then soft shell crab with garlic rock salt for main, finished off with banana fritters and coconut ice-cream and an egg coffee. Perfect end to a lovely night.